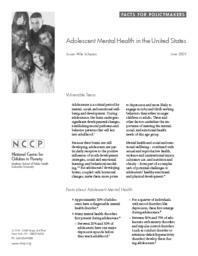 Adolescence is a critical period for mental, social, and emotional wellbeing and development. During adolescence, the brain undergoes significant developmental changes, establishing neural pathways and behavior patterns that will last into adulthood. Because their brains are still developing, adolescents are particularly receptive to the positive influences of youth development strategies, social and emotional learning, and behavioral modeling. But adolescents' developing brains, coupled with hormonal changes, make them more prone to depression and more likely to engage in risky and thrill-seeking behaviors than either younger children or adults. These and other factors underline the importance of meeting the mental, social, and emotional health needs of this age group. Mental health and social and emotional wellbeing — combined with sexual and reproductive health, violence and unintentional injury, substance use, and nutrition and obesity — form part of a complex web of potential challenges to adolescents' healthy emotional and physical development.